The large, long-lived fishes at or near the top of aquatic (especially marine) food webs, when exploited by multispecies fisheries, tend to decline faster than smaller, short-lived fishes with lower trophic levels. This results in the size and mean trophic level of exploited fish assemblages gradually declining, as does the mean trophic level of catches from an ecosystem exploited in this manner. This phenomenon, now known as ‘Fishing Down Marine Food Webs’ (Christensen, 1996; Pauly et al., 1998), has been documented through detailed analyses of fisheries catch data from a wide range of ecosystems all over the world (see The Science of Fishing Down). The widespread occurrence of ‘fishing down’ is the reason why, in 2004, the Convention of Biological Diversity (CBD) chose the mean trophic level of fisheries catches as an index of the biodiversity of large fishes (defined as fish with trophic levels > 3.5), called the Marine Trophic Index (see Pauly and Watson, 2005). This website is designed to encourage further research on and documentation of ‘fishing down’, notably on its intensity (in trophic level units per decade) and the various masking factors, which in certain circumstances, can make its detection difficult. For accessing the large number of regional, national and sub-national studies illustrating the occurrence of ‘fishing down’, see Case Studies. We welcome receiving further case studies (scientific publications or technical reports) documenting 'fishing down'. For a discussion of perceived objections to ‘fishing down’, based mainly on imputations and misunderstandings, see The Nature of the Discord. 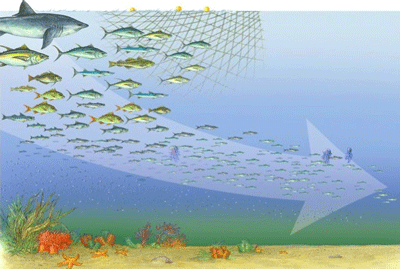 These are fisheries in which the non-selective nature of the gear used (e.g., longlines, trawls, etc.) implies either (1) a targeted catch consisting of a number of species, or (2) a large by-catch, in addition to the catch of the target species. In the latter case, a part or all of the by-catch may be discarded. The number of steps, in a food web, that separates organisms from the primary producers at the base of that food web. Trophic levels (TL) tend to range in marine food webs between 1 (phytoplankton, other algae, detritus) and 5 (killer whales, polar bears), and usually are non-integers (e.g., 2.2 for krill; 3.6 for a mackerel; 4.1 for a tuna, etc. ), because most consumers have an eclectic diet (see also FishBase ECOLOGY Table ).